← Get Outside And Get Moving! We’re busy people. Between work, family and social engagements, there never seem to be enough hours in the day. Whether your day job involves chasing your kids and running the household, sitting behind a desk, standing on your feet for hours, or catching a flight to the next meeting, sometimes the idea of working out is just too much. Except for the kid-chasing duties, any day at West Glen Communications, Inc. can involve almost all of the above. When I’m not putting together the lineup or filming for “Health & Home Report,” I may spend a day (or night) “in the field” with corporate clients for a video shoot followed by an edit. Or I may be at the computer writing scripts about everything from the latest Beta blocker to a survey about diapers. First, your body needs recovery time. In activities like resistance training, the goal is to place enough stress on your muscle tissues to cause the changes you want. But too much stress is never a good thing, especially when it comes to your muscles, tendons, ligaments and joints. Second, I know firsthand that if you’re completely exhausted and force yourself to go to the gym, chances are you won’t focus on your form and you could end up injured. Then you’ll be out of the game for more than one day. If you can’t stand the idea of being totally inactive, here’s an idea: Slip off those work shoes, lace up the sneakers (no flip-flops, please!) and take a walk! If you live in a city like I do where you can walk from home to work or at least part of the way, give it a try. Between the fresh air and the people watching, it never gets old. If the traffic lights cooperate, you can get a good pace going and get your heart rate up. General health guidelines call for 30 minutes of moderate cardiovascular activity each day. That includes walking, using the stairs, gardening and mowing the lawn. And guess what? Studies show performing three 10-minute bouts of exercise can have the same benefits as one 30-minute continuous exercise session. Need some combo ideas? 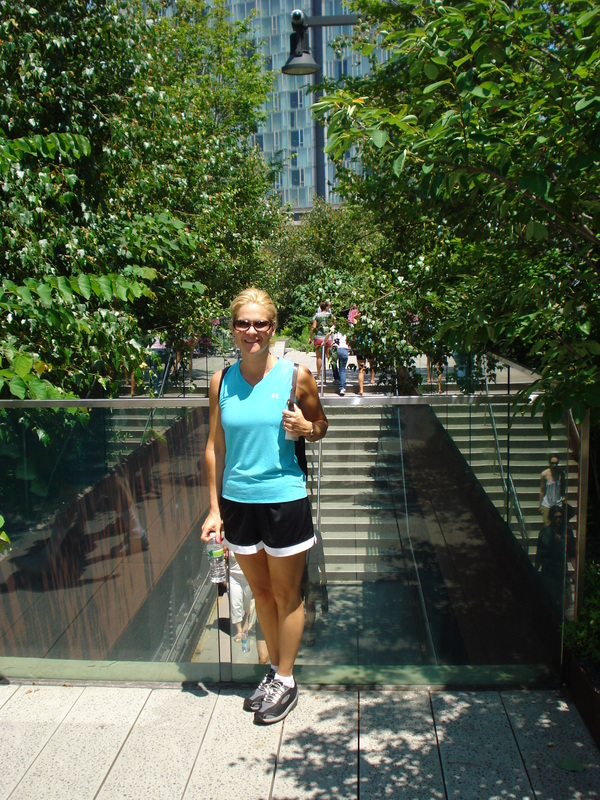 The High Line: A Great Place to Walk! Morning: Walk 10 minutes from your home to the office, or walk to a subway or bus stop that’s a little farther away. Or take a couple of laps around your child’s school after dropping her off. Lunchtime: Instead of grabbing a salad next door, walk 10 minutes to a different place. At home? Get out in the yard. Evening: Enjoy those last 10 minutes on foot in your own neighborhood, and bring someone special along. If you’re stuck working late – there’s always a staircase to climb. Whether you’re a power athlete or just getting started on a fitness routine, taking it easy is good for the body and the soul. In the end, just remember to have fun, be fit and feel fabulous! Posted on July 15, 2011, in Fitness and tagged Cardiovascular Activity, Fitness, Health & Home Report, Inc., Laura DeAngelis, Outdoor Fitness, Preventing Injury, Walking, West Glen Communications. Bookmark the permalink. 4 Comments. Thanks, Debbie! Glad you like them! I walk to Union Square every morning just for the fresh air, sightseeing and exercise. It’s not my closest subway stop — but just having that 10-15 minutes of “me time” is really exhilarating and puts me in a good mood for the rest of the day! Exactly the idea, Paula! I’m glad it’s working for you and on nice days like this one, it’s hard not to be in a good mood! Enjoy the weekend!